That year, however, the Hillsborough tragedy led to the football season being extended, and the Play-off Final was rescheduled for the very Saturday of Alan’s wedding. It meant that should Orient reach the Final, Alan was going to have the mother of all double bookings. 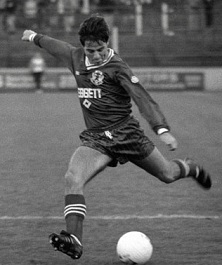 Alan in action against Crewe on 27 August 1988. 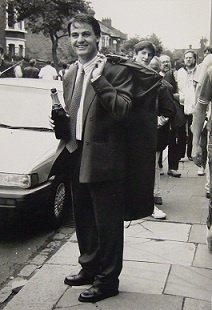 Thankfully, Alan survived, as did Orient, qualifying for the final courtesy of a 2–0 victory at Brisbane Road followed by a 1–0 loss in Yorkshire. 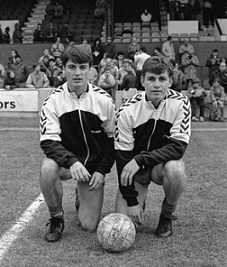 The first leg of the Final saw them draw 0–0 with Wrexham at the Racecourse Ground. The return leg was set for 3 June, leaving Alan with the slight problem of a wedding to consider. The ceremony was set for 3pm in Bangor in County Down, where Jill’s family hail from. Invitations had been sent, guests had booked flights and hotels – there was no way the couple could cancel. 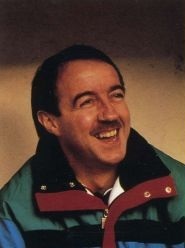 But where there’s a will there’s a way, and just as he used to begin a mazy run towards goal from midfield, Alan embarked on a plan to get himself from Brisbane Road to Northern Ireland. With the help of his brother-in-law, a newspaper editor, Alan got the Sunday Express to agree to print the story and make their helicopter available on the day. They would fly Alan from Leyton to Heathrow Airport, where a plane would take him to Belfast to connect with another flight to Newtownards, near Bangor. Everything was planned with military precision, and the wedding was moved to 5.30pm. On the day itself, the game actually kicked off 20 minutes late due to the number of fans still trying to get into the ground. Once on the field, however, Alan was focussed fully on the football. ‘It was so important I never thought about getting married,’ he says. Hi Thanks for sharing the soccer information. Thanks for the spam guys, much appreciated.